According to the data and stats that were collected, 'Gulbarga Today' channel has a mediocre rank. The feed was last updated more than a year ago. In addition 'Gulbarga Today' includes a significant share of images in comparison to the text content. The channel mostly uses short articles along with sentence constructions of the intermediate readability level, which is a result indicating a well-crafted news inventory on the channel. Short articles, prevailing on the channel, can be a good choice for 'Gulbarga Today' if they’re going to gain their audience’s sympathy with brevity. Also, there are medium-length pieces making up more than a quarter of all articles. Intermediate readability level is common for 'Gulbarga Today' articles as it addresses the matters that demand certain level of education to be understood. Sometimes the channel gets even more difficult by issuing pieces of advanced readability level (they make up more than one third of all content). In addition the channel contains some materials of a basic readability level. 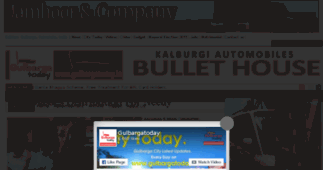 Unfortunately Gulbarga Today has no news yet. Eid Melad Un Nabi Celebration In Gulbarga. 130th Congress Foundation Day Celebrated In Gulbarga Today. Challenging Star Darshan With Fans. Unknown Dead Body Found On Railway Track In Gulbarga. Protest Against Demolition Of Shops. GPSW – 20 Protesters Arrested. “Rasta Roko” Infront of Vidhan Soudha. 2 Arrested in Yesterday’s Murder Case. Murder In Bhavani Nagar, Gulbarga. Fans Blocked Main Road To Meet Darshan. Darshan’s Fans Are Eagerly Waiting. 2 Dies In Road Accident. Police Arrested Man, Seize Weapon, 3 Bullets. 4 Arrest In Murder Case of Bhavani Nagar, Gulbarga.